LLR69150 : Lorell Lorell Essentials Conference Tabletop - Oval Top - 48" Table Top Width X 96" Table Top Depth X 1.25"
Lorell Essentials Conference Tabletop - Oval Top - 48" Table Top Width X 96" Table Top Depth X 1.25"
Oval Conference Tabletop Is Designed For Use With Lorell Essentials Conference Table Bases. The 1" Thick, Mahogany Laminate Top Has A 3.0 Mil Thick Edge. Table Is 29-1/2" High With Adjustable Floor Glides On A Two-Panel Leg Base. Top And Base With Modesty Panel Are Sold Separately.. 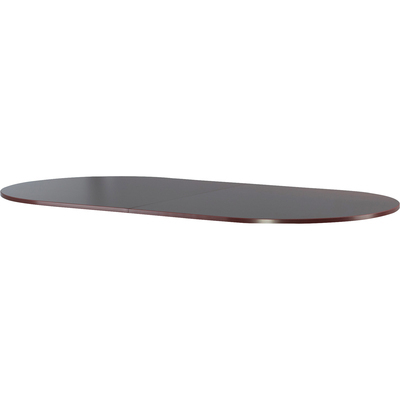 Oval Conference Tabletop Is Designed For Use With Lorell Essentials Conference Table Bases. The 1" Thick, Mahogany Laminate Top Has A 3.0 Mil Thick Edge. Table Is 29-1/2" High With Adjustable Floor Glides On A Two-Panel Leg Base. Top And Base With Modesty Panel Are Sold Separately.